PITTSBURGH — Colt McCoy had to feel like a guy who knew his check-engine light was on and as he was driving had one tire go flat, then a few miles later had another go flat. The rookie quarterback had no choice, though. He had to keep driving. McCoy, already third on the Browns' depth chart at quarterback, went into Heinz Field with top running back Peyton Hillis playing with a quadriceps injury, center Alex Mack playing with a bum shoulder and right guard Floyd Womack playing with a sore knee. With 8 minutes, 51 seconds left in the second quarter, Josh Cribbs was knocked out of the game on a helmet-to-helmet hit by Steelers linebacker James Harrison. On the Browns' next series, Harrison knocked Mohamed Massaquoi out for the rest of the game with another blow to the head. The avalanche of injuries and Ben Roethlisberger's return from a four-game suspension were too much to overcome. The Steelers punished the Browns, 28-10, on a day when McCoy did enough things right to say he was worth a third-round draft pick. 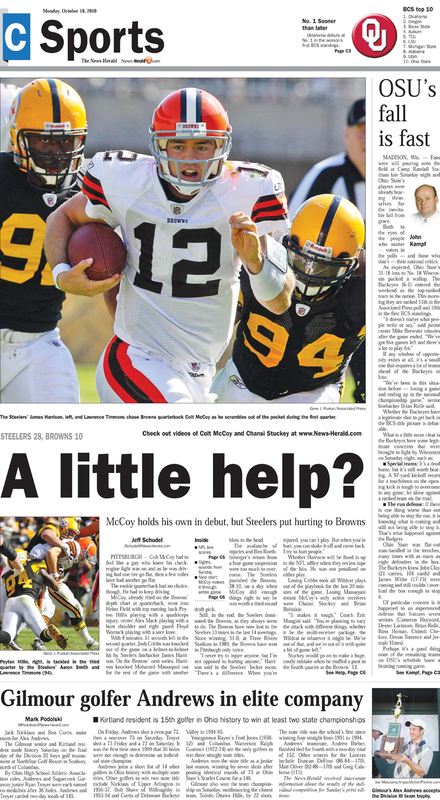 Read more from Jeff Schudel's game story, Steelers 28, Browns 10: A little help?.